Would you like to cut your living expenses in half without giving up modern luxuries? Me too. That’s why I wanted to meet Michael Mobbs and see his home that’s (almost) off the grid in the heart of a big city. 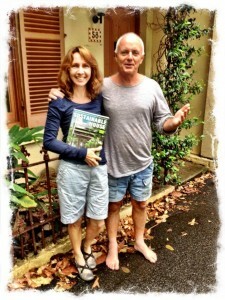 On a recent trip to Sydney, I had the opportunity to meet with Mobbs and get a private tour of his Sustainable Home. Here’s what I learned . . . Since 1996 Michael Mobbs has lived in a unique house in the center of Sydney, Australia. If you rode by on your bike, you wouldn’t notice anything different from the outside. Only a plumber or electrician working on the inside would know the difference. With three other house friends, Mobbs’ total annual water and energy bills are less than $300 AU or about $280 US. His three bedroom home is about a 40 minute walk from the Sydney Opera House. He has solar panels on his roof. The electric company sends him a check to pay for the clean solar electricity he puts into their main grid lines. In 1996 he disconnected the water and sewer. He uses rain water that falls on his roof in place of tap water. He treats his own water that flows from his toilets, washing machine and kitchen sink. The system recycles the water back into the house. 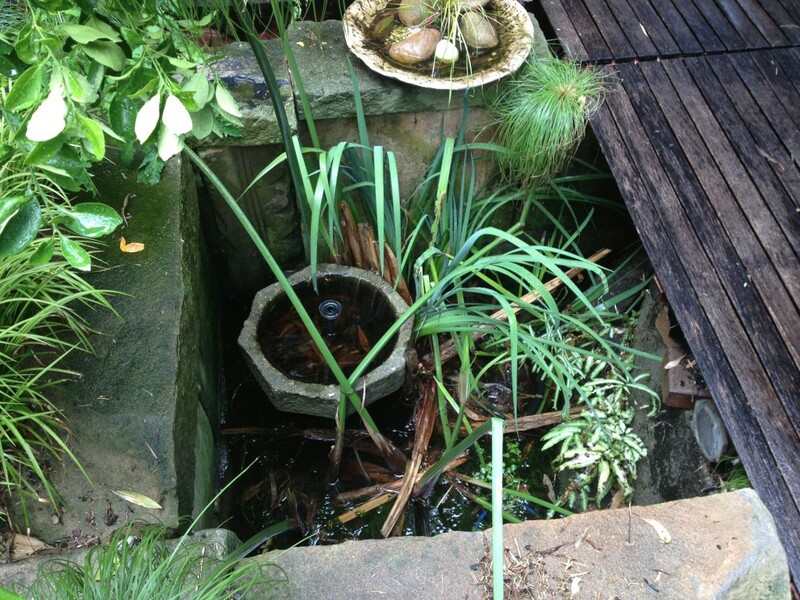 He uses the recycled water to flush the toilets, wash clothes and hose his beautiful backyard garden. He doesn’t pay any water or sewer bills. In his book, he describes how the simple wastewater system works. The house is still connected to gas. The annual bill is about $200 US. “I’m not special, kinda short, have no handy skills and can barely drive a nail. If I can do it, you can too,” says Mobbs. Even if you do own a home, you may not be ready to generate your own electricity and collect and process your own water. But you can begin with smaller projects. I asked Michael for some tips that almost anyone could apply regardless of where they live. 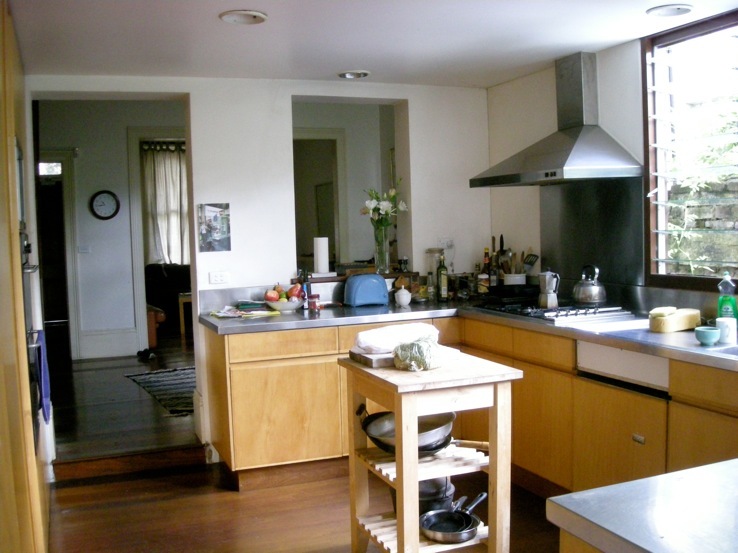 Here are some of his recommendations on how to save money even if you’re renting an apartment. 1. When one of your lights goes out, replace it with an LED bulb. LED lights are much more efficient. 2. Paint interior walls shades of white. This also applies to outdoor areas, such as fences. White reflects light back into your rooms. Avoid dark carpet, walls or furniture. Black eats light while pale colors bounce it around. 3. Install a water efficient shower head. You can take it with you if you move. It saves the energy that it takes to make the water hot and it also cuts down on your water usage. It can save over 15,000 gallons of water a year in a four-person household. This is especially important if you have one or more people in your household who take long showers. Even if you take short showers, you can relax knowing that the same amount of time will cost less. 4. Get a water and energy efficient dishwasher and washing machine. This can knock up to 50% off your energy and water bills. Efficient ones will use about 10-20% of what the standard guzzlers use. 5. Get the most energy efficient refrigerator possible. It runs 24/7 and is typically the biggest energy-using appliance in your home. 6. Catch rain water if you can. You can use it to water your indoor and outdoor plants. You may be able to do this even if you’re in an apartment and only have access to a small balcony. 7. Grow food you can eat. Even if you don’t have a lot of space, you can grow mint, garlic, rosemary, lemongrass and other plants suitable for indoor environments or small spaces on balconies. Grow mung beans for your salads in a glass jar on your window sills. Get involved with a community garden if there’s one in your neighborhood. If you have too much of one type of food, swap surplus food with other gardeners. 8. Buy food from your local farmers markets. Fresh produce is always healthier and more nutritious than the store-bought refrigerated stuff. 9. Compost fruit and vegetable scraps to make soil for your pots and/or garden. Even if you don’t have a lot of space you can add worms to your compost and they will turn it into fertile black gold (dirt) in 1-3 months. Mobbs says a modest meal which includes a small portion of meat puts a much greater strain on the environment than a meal that’s fully vegetarian. We need to think about our overall impact on the environment even outside our homes. “The energy and water needed to keep me alive is about 20-40 times greater than the energy and water needed to run my house. Yes, my house saves over 100,000 liters (about 20,000 gallons) of dam water a year by harvesting the water which falls for free using the natural stormy energy of the skies. But in ten days of eating the typical Australian diet, there’s over 100,000 liters of water needed to grow, harvest, clean, store, package, transport and refrigerate my food. My little tummy uses far more water and energy than my house,” says Mobbs. The costs, designs, products, materials, tragedies, mistakes, truths, and failures of his house and tummy are spelled out in his two books: Sustainable House and Sustainable Food. “Plug the leaks in your home. When you take steps to reduce your living expenses and environmental impact, you may ultimately reduce your financial stress and have the chance to invest in new opportunities with the money you save,” Mobbs says. A few years ago my husband and I traded in our big suburban home with a 3-car garage for smaller living quarters. This freed up both time and money giving us the opportunity travel to places like Sydney. 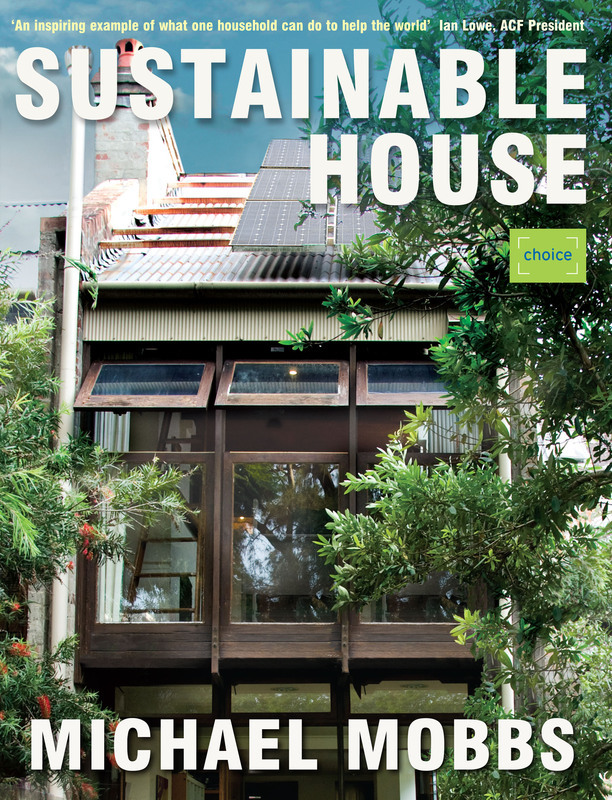 The next time you’re in Sydney, be sure to tour Michael Mobbs’ Sustainable House or see the scaled down version of his home at the Powerhouse Museum near Darling Harbour. 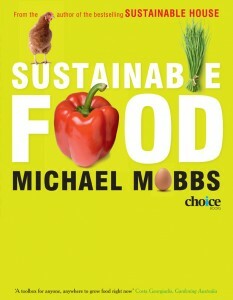 In the introduction of his Sustainable Homes book, Mobbs offers some of the key lessons he learned through the decisions he made with his own home. If you aspire to create a more sustainable home, look for others in your community who are making changes in their homes and lifestyles. You’ll get there much quicker if you share your challenges, successes and fears with them. Steven Wright recently moved into an all electric house. One evening he forgot to turn off the lights before he went to sleep. When he woke up in the morning to let his dog out to pee, the front door wouldn’t work. It’s helpful when your cohorts share common factors such as weather, jurisdictions and local suppliers. And even better if they have some professional experience that might help to expedite projects. Mobbs happens to be an environmental lawyer by trade. In 2009, The (Sydney) Magazine listed Mobbs as one of Sydney’s 100 most influential people. 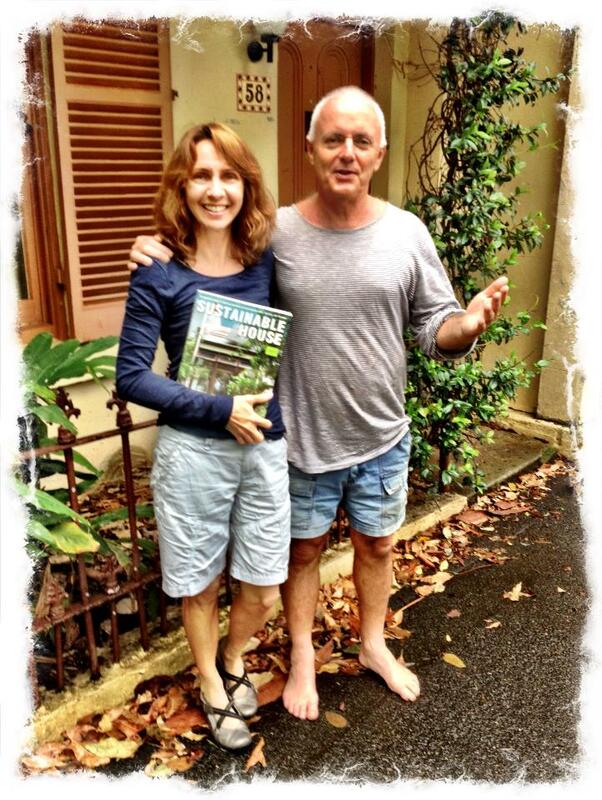 See the About Michael page on the Sustainable House website to learn more about him.